I have a past in the art form going back to the open mic opportunities I took in college in Manhattan in the early ’90s, when my friends and I would hit the downstairs piano bar of Rose’s Turn in the West Village every Friday night. More recently, I’ve performed in a few showcases over the past decade, including with the Gay Men’s Chorus of Washington, DC, and as part of the CHAWbaret fund-raiser for the Capitol Hill Arts Workshop. In that same time as well, I’ve seen shows featuring friends of mine, many of whom I’ve sung with elsewhere. But I never made a routine of performing in cabaret open-mic nights or developing shows of my own or appearing in others’ shows. And as much as I appreciated being a part of something meaningful, I seemed to remain in the shadow of the “confusing sub-culture of the arts” rather than seeing clearly in its light. I used to ask myself why these singers went to such lengths to slow down lines the way they did, speak words instead of sing them, and go on with such… drama. Then those words came to me … and stuck. “Don’t you sing that note!” In fact, they came from Lina herself. They came as I struggled to maintain my pitch and preserve my dignity on stage while tears stung my eyes and my voice broke. I was trying to sing when singing was not what I meant. Afraid that I’d seem rough and unentertaining, and horrendously uncomfortable at feeling emotionally exposed in front of other people in such an intimate setting, I learned that the emotions I fought desperately to contain were the very thing Lina (figuratively) reached inside me to pull out for the audience to see. And feel. Cabaret is scary. And exhilarating. And a triumph! A week ago today, 20 students, including three of us from the DC area, entered into Davenport’s Piano Bar in the Wicker Park neighborhood of Chicago to begin three days of intensive training … or as some in the class debated early on, intense training. 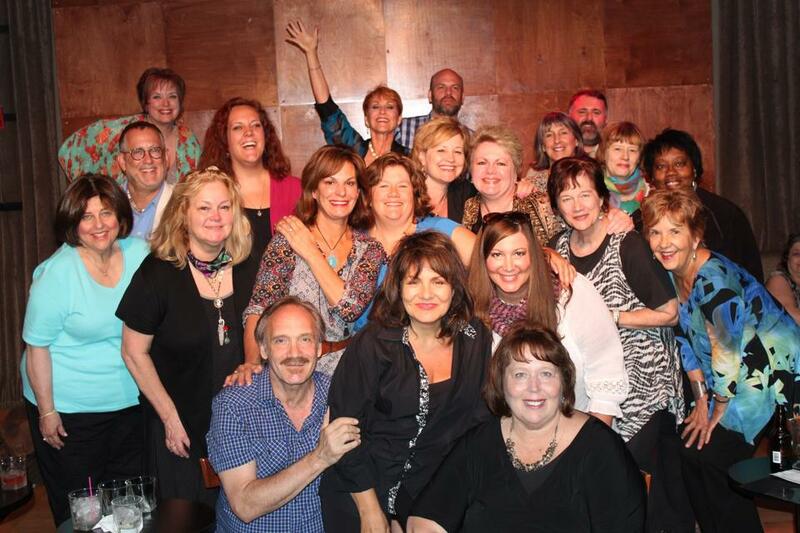 We participated in the fourth annual Midwest Cabaret Conference. Co-founders Lina Koutrakos and Rick Jensen, both New Yorkers, were joined by Chicagoan Beckie Menzie and the legendary actress, songwriter and cabaret star Amanda McBroom, who came to Chicago from California. The students came from as far as Palm Springs and New York City and joined several Chicago-based cabaret performers. We brought songs. We told stories. The master teachers gave us feedback, encouragement, critique, and pressure. They also gave us the gift of their own talents. Our first night together, we were treated to two full-on cabaret shows, first the formidable Lina with Rick, then the divine Amanda with Beckie. For someone who had lived so long in the shadow of this “confusing sub-culture of the arts,” finally I could see and hear exactly what each of these gifted and longtime entertainers brought to the stage. As a first-timer, I marveled at each master teacher’s ability to deconstruct each song and each performer, even if the song was obscure or unknown or if, like me, they hadn’t worked with the singer before. During sessions, each student had the opportunity to perform a song of his or her choosing once all the way through. Then the teachers would take each part of the song and not necessarily just tell the student how to handle it. They would ask the student constantly about their motivations and their feelings. “Who are you singing this song to?” they’d ask. “What has just happened as you begin this song?” The underlying meaning for the singer didn’t have to be literal or closely connected to the song’s content. It had to connect with the spirit of the song. If it was a song about seduction, who was your target? If it was about loss, who (or what) did you lose? If it was defiance, who was that person from whom you were wresting back control of yourself and your destiny? In the end, it was about how the song translates to the audience by way of your interpretation. I realized it right away. Don’t take a line that has a deep meaning, maybe even an important turn in the song’s lyrical path, and make it “pretty,” as if the magma underneath it doesn’t matter or needs to be smoothed over in order to please the audience or prove what a good, disciplined singer you are. If that line is authentic to you and if singing seems trite or just untenable, say the line. More importantly, feel the line. Don’t sacrifice your feelings so that what you’re singing loses its power. Your song means something specific, even if your connection to it isn’t literal. Bring out that meaning. Bring out the emotion. Your audience will pay attention to you, and the more of your inner self those people get, the more they will love what you’ve given them. As I think on it, I realize now that it’s similar to a friendship or a romance. Ideally, you’re not being embraced simply because you look good or sound good or say (or sing) all the right things. You’re embraced because you are the unique, feeling person you are. Your life experience and the art that inspires you don’t have to be the same as those of your audience members, fellow singers or anyone else. You bring yourself to this game, and that’s your strongest asset, with or without the vocal coaching, the voice major or the degree (or resumé) in musical theatre. Not only is this a beautiful thought. It makes for beautiful moments, many of which I saw all weekend long. Every student transformed in front of my eyes, their performances growing a little more biting, a little more sorrowful, a little more joyous, a little deeper below the surface. There were other lessons, such as adaptability when working with a music director, considering different tempos, styles and even key signatures when working on a new song. Beckie Menzie, an accomplished songwriter, accompanist and cabaret singer, prides herself on “bastardizing the Great American Songbook,” taking a standard and switching the dial perhaps just a hair off your familiar level, in turn making it something that feels new. She can take a song like the Arlen-Gershwin-Harburg number “Let’s Take a Walk Around the Block,” which I performed fairly faithfully in the DCCN Membership Showcase last March, and make it pensive, minor-driven, even melancholic, or she can make it insistent or subversive. …then in front of an audience. Each student performed a single song for a showcase last Sunday night for Chicago’s cabaret community. If I thought my own experience was powerful, I almost can’t find the words to tell you how it felt to see so many of these people I had only a few days to get to know transform from tentative singers, as this workshop launched, to the poised, confident entertainers they became. As I was told would be the case, it turns out I learned more from watching them than I did from experiencing it myself. From comedy to seduction to inspiration to desperation, from Broadway to jazz to country to rock, that audience experienced a wide spectrum of music, all brought into the realm of the “confusing sub-culture of the arts,” this thing called cabaret. Of course, all this that I’m saying many of you know and have known for years. You’ve dedicated more of your life to this art form than I have. What purpose, then, is there in trying to create new tread over well-laid tracks? All I can tell you is that, the way it looked to me, even the most experienced singers had breakthroughs, eyes reddening as the song’s lyrical power finally enveloped them, paces and tempos varying as these singers ever more clearly saw the people and circumstances bringing them to these lyrics, and special places in their voices flexing, places that at first they weren’t sure they could reach. Many of us will travel and participate in these workshops repeatedly or find new teachers or have intensive (or intense) sessions with music directors to dig through to the emotional core of a song. And yet perhaps a workshop newcomer’s perspective can remind us of how it was to experience it the first time, to be the one no one knew, to take that uncomfortable journey and to come to one’s power — even if just a brush against it — and make an audience feel something profound for a few minutes, to be told by a master teacher that that song you just did was yours now. I’ll never have that experience again. I have many to thank, and now I am even more excited about my journey. It may be similar to yours, and maybe you will have wisdom you can share with me once our paths cross. You’ll see me make rookie mistakes or make decisions you wouldn’t. But that will be fine for me. If nothing else, at least now I know that the best part of any show I create in the future will be that which is mine uniquely, the same as it has been and will continue to be for you. And I will learn from what I see you do, and I will love every mile along this long road. And when the moment’s there, I promise: I won’t sing that note. Guest blogger Andrew Harmon is a former chorus singer turned nomadic entertainer living in the District of Columbia. He welcomes any and all opportunities to learn, grow and perform.